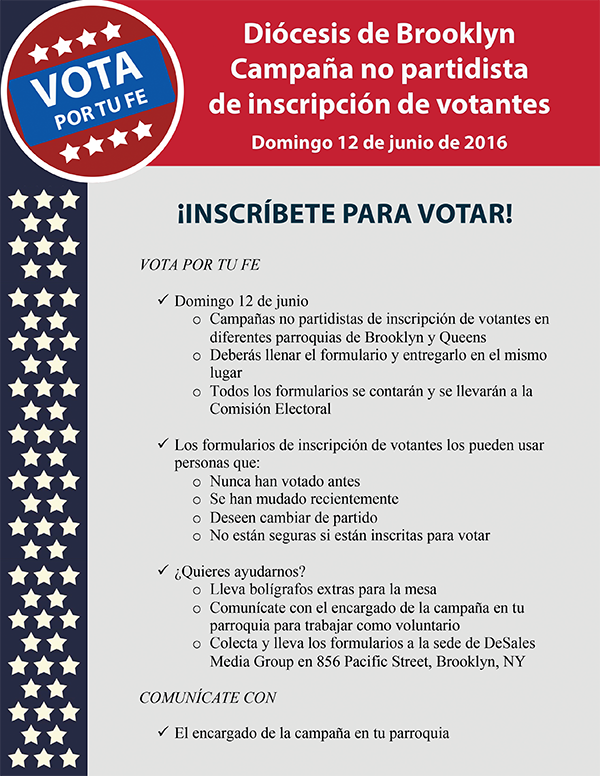 Don’t forget to vote in the New York City Primary Elections on September 13! Polls are open from 6 a.m. – 9 p.m. 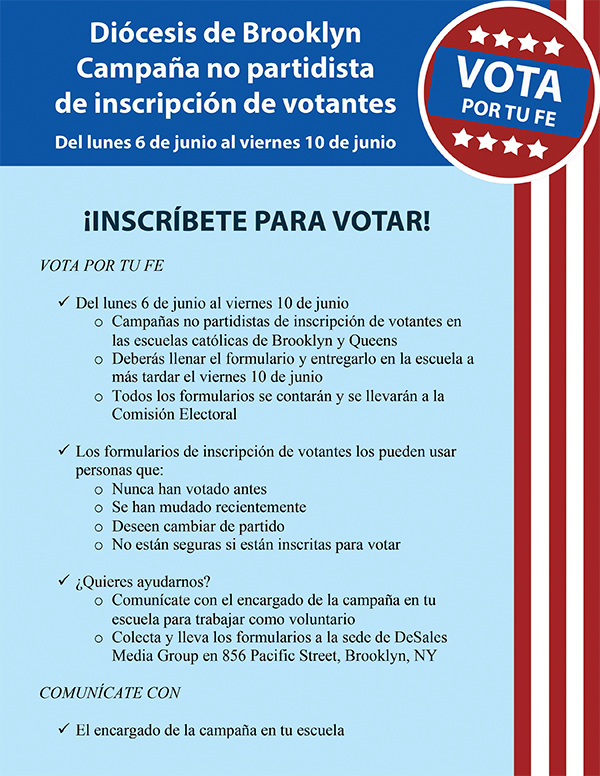 If you have any questions about where to vote or to check if you are registered, call the NYC Board of Elections at (212) 487-5400, email electioninfo@boa.nyc.ny.us or go to vote.nyc.ny.us! On Monday, July, 11, in the wake of continued violence between the police and communities around the country, Brooklyn community members joined in Grand Army Plaza to pray for healing. Nearly 2,000 members of the community were joined by local police officers, NYPD Deputy Chief Chaplain Robert J. Romano, NYPD Chaplain Monsignor David L. Cassato, Rev. A.R. Bernard, Dr. Uma Mysorekar of the Hindu Temple Society, Brooklyn Borough President Eric L. Adams, and The Most Reverend Nicholas DiMarzio, Bishop of Brooklyn, for the vigil. DeSales Media Group designed and distributed the event flier and program booklet, below. 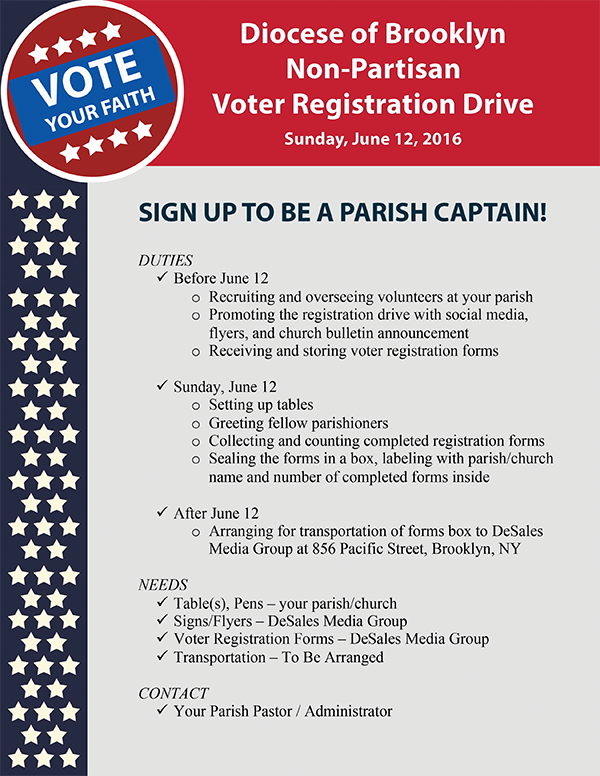 Diocese of Brooklyn Non-Partisan Voter Registration Drive! 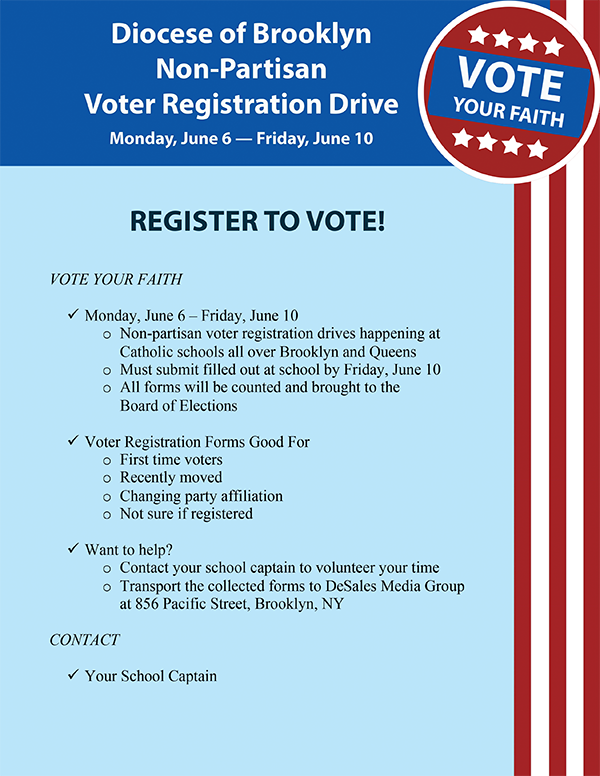 The Diocese is undertaking a massive voter registration drive, with schools and academies registering parents of students from June 6 through June 10, and our parishes featuring voter registration tables outside of Sunday Masses on June 12. 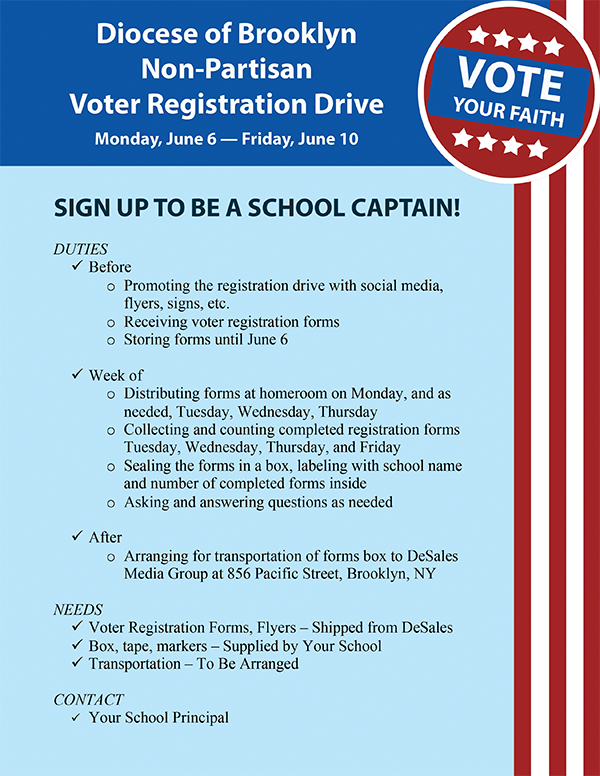 This service to our parishioners and parents is useful for those who need to register for the first time, update their registration, change their party affiliation, or simply make sure they are registered voters. To participate or volunteer, see your pastor or school principal for details. The Education Tax Credit (ETC) legislation would provide $150 million in additional funds to help families pay tuition. Last year, the ETC came very close to passing into law but came up short in the State Assembly. To make it a reality, we need even more families, teachers, and staff to make our voice even louder! Go to nystatecatholic.org, click on “Take Action” and make your voice heard! The New York City Police Department today announced street closures and anticipated traffic delays relating to the visit of Pope Francis. The use of public transportation for the duration of the visit is highly encouraged. 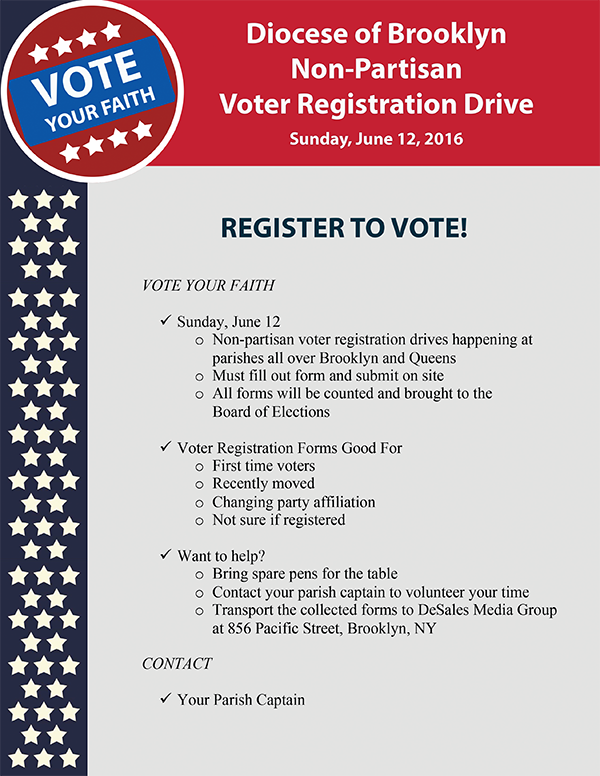 This message is being sent on behalf of Vincent LeVien, Director of External Affairs for the Diocese of Brooklyn. Once again, our elected officials in Albany have failed their constituents. Incorporating the Education Tax Credit into this year’s budget would have helped strengthen programs at public schools, helped enable scholarship organizations to make private and parochial schools more affordable for families, and helped teachers pay for classroom supplies. But the Education Tax Credit was left out of the final deal. Speaker Heastie chose not to help us. The State Assembly chose not to help our schools, teachers, and families. They decided that instead, we would have to settle for payments on mandated services that were already owed to our schools. That’s not good enough. Here’s a rarity for New York: Assembly Democrats are standing firm against dozens of labor groups by blocking a bill that would help the union members’ kids. The bill would encourage giving to union (and other) scholarship funds, by offering donors a tax credit. Grants from these funds would go to poor and middle-class families, including those who belong to the unions, to help them afford private and religious schools and so escape rotten public schools. “Assembly Member Nolan’s last-second proposal is a phony-baloney ruse that’s as misleading as it is useless to families in need. She continues to oppose real school choice for middle class and lower-income families. “While rich people have choice in education, Assembly Member Nolan is only willing to toss crumbs to the middle class and the poor, who need real help if they’re going to close the income and educational gaps for their children. This bill proves that if it were up to her, only the wealthy would be able to afford real school choice. Brooklyn, NY – Labor leaders today called for the adoption of the Education Tax Credit before lawmakers finish their work for this session – which is scheduled to conclude on Wednesday, June 17. With the bill being a priority for Governor Cuomo as well as having passed the State Senate several times with strong bipartisan support, it is now up to the State Assembly to determine whether working families will get the help they need for their children’s education. The proposal has received strong endorsements from a coalition of unions. With the clock running out, union leaders representing first responders, firefighters and public safety workers called on the State Assembly to pass the bill. Families from The Bronx and Harlem to rally in front of office of NYS Assembly Speaker Carl Heastie, urging passage in coming weeks. Families from the South Bronx and Harlem will rally in front of the office of New York State Assembly Speaker Carl Heastie (D-Bronx) on Thursday, June 11th, from 8:00 to 9:00 a.m., 1446 East Gun Hill Road, in the Bronx. Attendees will advocate for the Speaker’s support, and passage of, the Education Tax Credit into law.